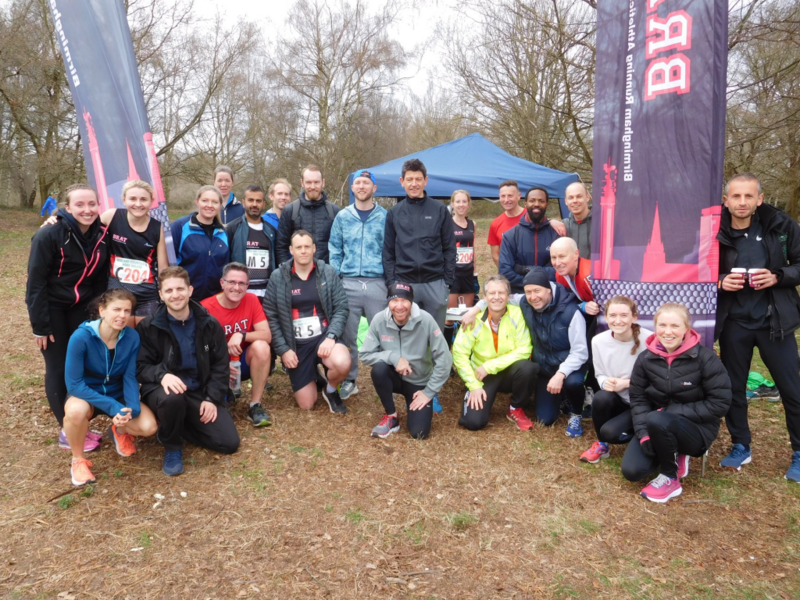 Saturday 23rd March saw Team BRAT head to Sutton Park for the Midland 6-stage and 12-stage Spring Road Relays. The sun was shining and the conditions were some of the best we’ve ever had for the relays, an improvement on the blizzard that runners battled with at the same event in 2018. BRAT had two complete ladies teams and the men had two complete teams and a third team shy of a couple of runners. The flags went up in our usual spot and eager runners arrived ready to give it everything over the familiar undulating and challenging long and short loops. BRAT Men were off first. Dan Robinson led the team out on the first of four long legs. Dan produced a brilliant run to bring the A team into 8th place. Great runs followed from Martin Matthews who wasn’t far behind in 36th for the B team and Dimitris Tsokoli in 65th for the C team. Whilst the men were out on leg one, it was the women who took to the start line opening with a long-leg. Molly Browne and Rachel Brown kick-started our teams. Molly took a minute off her previous time on this course to bring the A team into 2nd place after leg one, Rachel had a great run to finish her leg in 52nd a brilliant start for the women. Back to the men, who were now well into their second leg with James Marshall for the A team maintaining 8th place after a solid run. Damian Cartland bounced back from his half marathon for the B team and Andy Piddington had a great run for the C team moving them into 58th. Up next Mark Ince flew around the course taking 2 places along the way, Huw Jones and Harry Fowler both ran very well keeping the B and C teams well on track. The A team then saw a set of superb runs from Joynny Cullen, Ben Carrington, Nick Lewis, Simon Lanckham, Thanos Tsolakis, Steve Dunsby, Jonathan Jenning, Nathan Warren and Colin Bailey to finish in 7th place overall – a fantastic performance and one that saw the team secure their spot for the National Road Relays in a couple of weeks time. The B team chipped away at their overall position as Brian Mcevoy, Rob Dowse, Chris Burrows, Adam Western, Nick Price, Nick Seagrave, Chris Grimley, Richard Gray and Paul Falkiner all ran brilliantly to finish in 36th place overall. Despite being incomplete, amazing runs were had by Rob Ryan, Martin Ludford, Robert Rose, Kelvin Duncan, David Sansom, Sandeep Dhami and Jort Vanmourik – a mention to Dan Robinson who guided Kelvin to complete a great leg for the C team. Our ladies teams were still battling hard. In the A team, Molly handed over to Jen Straw who sped round the first short-lap of the day and brought the team home in a great position as Rachel Farquhar headed off on the long-lap. Rachel produced a brilliant run only a week after a great half marathon PB and the A team were holding onto an amazing top 5 position. Next up was our team manager, Eloise Lee on the short-lap who was swapping the fells for the roads – at least there were some good hills. Eloise had a great run to hand over to Hazel Murray on our penultimate leg. With a fantastic run from Hazel, we were in contention for a top 5 finish. Anne Kenchington, anchoring the A team, stormed off flying past runners and found herself in a great battle up the final hill bringing the team home in 5th – our highest ever 6-stage finishing position! In our B team, we had amazing performances coming thick and fast. Rachel handed over to Catherine Robertson who produced a brilliant run to bump the team into the top 50. Next up Sophie Dalley, again a week on from an epic PB at the Reading Half, she took another place on the long-leg with a super run. Dropping down a fair bit of distance we had our ultra star Helen Pike flying round the short-lap to hand over to Catherine McNicholl on the penultimate leg. With a fantastic run, Catherine came speeding up the final hill where Hannah Ludford was ready to go. Hannah had a cracking run to bring the B team home in 43rd place – a great result! We also had two top 10 individual legs of the day. Anne Kenchington 8th fastest over the short-leg and Molly Browne was 3rd fastest over the long-leg. It was a brilliant afternoon at Sutton Park, the team moral was amazing and everyone had such good fun. Great to be cheered on by some top BRAT supporters, and coach Richard Carney stop watch in hand giving encouragement on the final straight. A big thank you to team managers Eloise Lee and Richard Gray for sorting and entering teams, and for all of the organisation on the day.